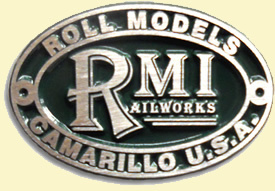 Owners Circle - RMI Railworks Roll Models Ind. : Miniature train and railroad equipment for your club, backyard, or park. As a maker of premium railroad equipment, we are never more pleased than when we see our designs find happy homes. Below you'll find images of just a few of our customers with their models. If you are an RMI customer and would like to have your picture added here, please submit a digital photo (in either JPEG or GIF format, at 500x360) to us at info@rmirailworks.com or mail one to us and we'll scan it for you. Bill Pardee's beautiful RMI Prairie Locomotive built by Bill from an RMI steam kit. Located at the Adobe Western RR, Maricopa Live Steamers.